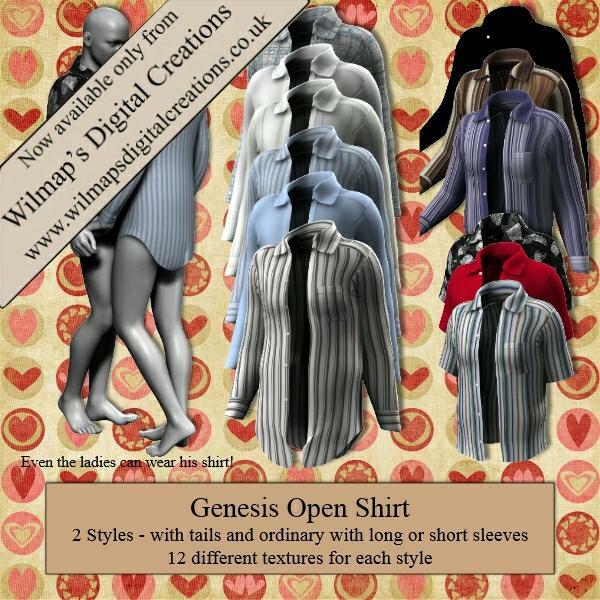 An open shirt for Genesis for use in Das Studio 4. Two styles - shirt with tail, and ordianry shirt with long or short sleeves. Several textures included. Onyxage (5 years ago) Inappropriate? raiza68 (5 years ago) Inappropriate? Monstaah (6 years ago) Inappropriate? ZanderRBG (6 years ago) Inappropriate? sorry my computer is acting weird. Am I the only one who can't download these awesome resources? starmusicfly (6 years ago) Inappropriate? Thank you sooooooooo much. Exactly what I wanted!!!! SuperBoomTurbo (6 years ago) Inappropriate? Holy smokes! Normally I skip these as they turn out to be just texture sets. But an actual shirt?! Woo Hoo!!! marcoio (6 years ago) Inappropriate? Now it works fine, thanks again! mininessie (6 years ago) Inappropriate? michaeltoonz (6 years ago) Inappropriate? Thanks Wendy , you're so incredibly generous. Thank you for your consistent time and effort spent on these wonderful items for the Daz community. Mats don't work on Shirt with Tails! Now updateding the Part 2 File. Thanks, Wendy, for another great and very useful clothing item!